My cousin shared a photo of his father and sister in Queens, NY, shoveling their car out of heavy snow. 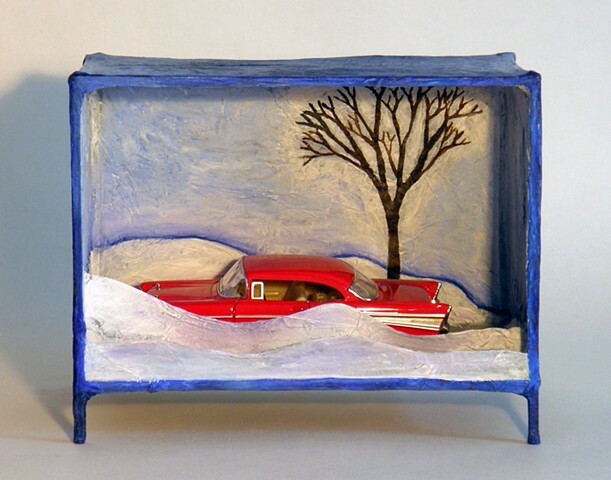 Inside Reliquary for Sand and Snow, a toy classic car epitomizes the nostalgia of that snapshot. I omitted the figures of my uncle and cousin, leaving only the tree, leafless against the winter sky. The warmth of the Southwest desert juxtaposes the interior scene. This piece pays homage to cross-country road-trips of the 1950s and families separated by miles.